You’ve got some key elements in place: a vision of your brand, some finger-licking recipes, and a readiness to get on the road. It’s time to get into the nitty-gritty and plan for your food truck start up costs. A food truck that’s outfitted with all the proper equipment can run upwards of $50,000. Don’t skimp on this: the truck is your base of operations and where you’re going to be spending much of your time. Other food truck start up costs include money for insurance, food supplies, design and advertising, employee expenses, plus any permits your city might require. If you add in sundries and some professionals to take care of bookkeeping and legal advice, your start up costs can reach as high as $100,000. There are, however, a number of ways to save money on your food truck start up costs. Instead of buying a POS system and cash register look at apps such as Square, PayPal Here, or Stripe that you can use to accept payment on your phone or tablet. Restaurant supply warehouses often have lowered prices on gently used equipment, allowing you to shave off some zeros from your costs. 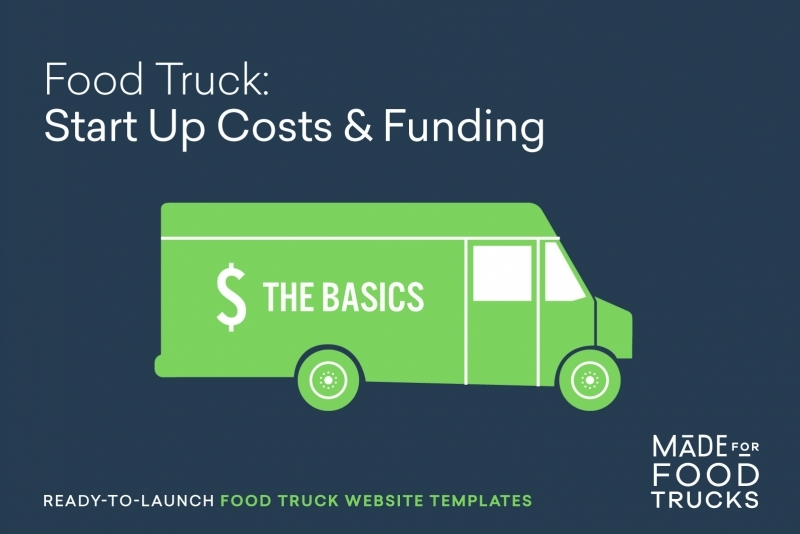 And rather than shelling out the big bucks to have your website designed, you can use one of Made For Food Truck’s easy-to-launch templates to build a professional website. Get started here. To get funded by a traditional bank, you will need a business plan that calculates costs, plans for growth, and estimates the return on your investment. This plan will be your foundation for success, so research how to write one that’s specific and realistic. Many cities have local entrepreneur centers and resources for small business owners that will help you in this step. Plug into entrepreneurs in your network and ask to see how they planned for their operational costs. Then, start mapping out how much cash you’ll need to get off the ground. Let’s talk fundraising options. If you’ve been planning your food truck for a while, you might be in the position to self-finance. If you are, you will still need your business plan and the advice of an accountant to make sure you’re on the right track. But if you don’t have the money you need to get started, there’s still hope. Consider crowd funding your food truck start up costs on Indiegogo or Kickstarter. You could also research local investors and work up a solid pitch to sell your idea. The U.S. Small Business Administration has lots of information about types of investors and how to approach them. If you want to go the more traditional route with a business loan, you’re likely to find low interest rates and flexible repayment plans at a local bank or credit union. They’ll need itemized start up costs, so consider having a pro look over your plan before you head in. Of course, consult a lawyer who specializes in small business financing before you sign anything. All of this might sound daunting, but the hard work will all be worth it once you’re on the road and satisfying your customers. Do your research, do things right, and you’re in for a smooth ride. Don’t forget to check out our Getting Started Checklist for more great ideas to get your wheels spinning.